We at Texas Custom Mirrors were asked to design a large floor mirror for a loft apartment in San Antonio, Texas. This floor mirror was 80″ inches tall and 40″ inches wide. 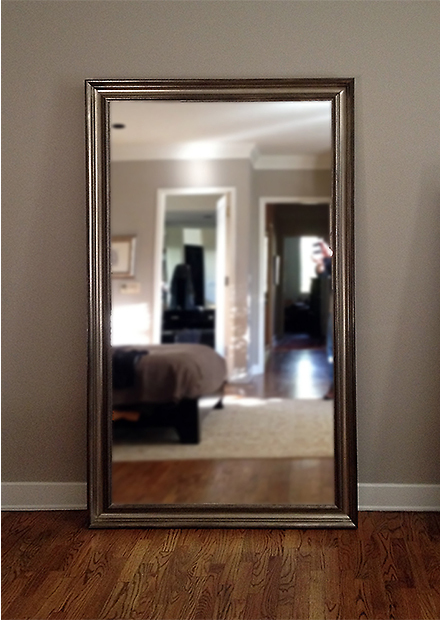 We used an antique silver frame to build the mirror and it was large enough to support the glass with strength. This floor mirror was designed with a wall attachment so it is not only leaning against the wall unattached. It is hooked to the wall but leaning. The mirror was delivered to the customers loft apartment . It had to be carried up 2 stories to get it to the room. Complete installation was purchased and we attached it to the wall. It is a beautiful floor mirror and you can view the photos as you see.